don't dare write a piece without consulting this! I used to write professionally during the first three years of my professional life. When I was younger, I used to compete against young writers from other schools in an annual battle of writing enthusiasts and student reporters nationwide. Think of it like Glee, with sectionals, regional and nationals in place–except this gives you hours of silence and only the sound of pen scratching against paper as student-writers craft their piece. Yet in spite this–even if I have been writing for almost half of my life–I won’t deny that I still have lots to learn. Plus, I have to admit that there are times when I am not even sure of the grammatical nuances of my own blog post. If there’s one thing that I regret after leaving my life as a struggling (and starving) reporter and choosing the profitable (but utterly brain-numbing) life of a corporate drone, it’s the fact that I didn’t get to advance my talent (?????) in writing as I would have liked. Truth is, writing will always be my first love. It’s the thing that makes me happy. When I used to write (for a living), I may dread deadlines but the high of finishing a story and surviving the wrath of my editors simply exhilarates me. Now, I am lucky if I get the occasional happy feeling after seeing a press release (which has been edited twenty thousand times) will see the light of day after pitching it to the media. Anyway — forgive the rant. Again. 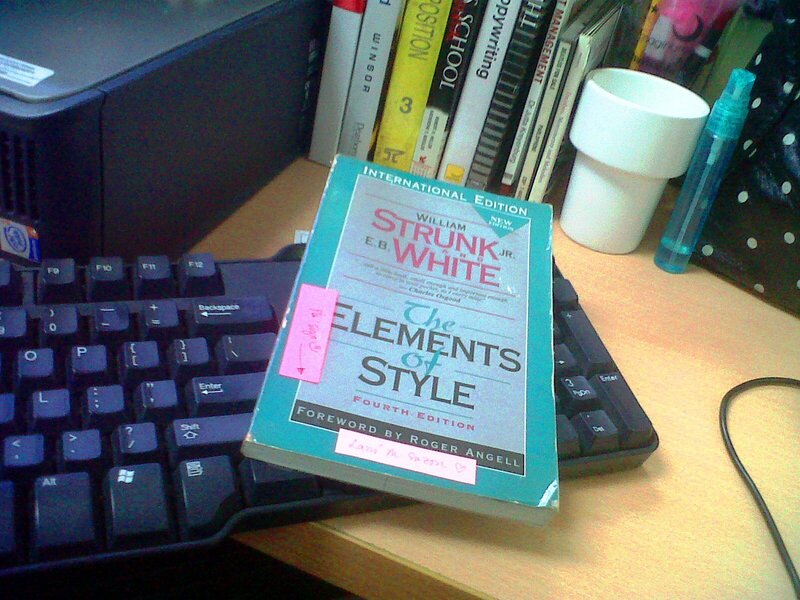 The reason I survived then and is still surviving now (read: memo, policies, strat plans and all the other boring stuff) is because of my good old “Strunk and White: The Elements of Style”. This tiny book by William Strunk and EB White is intended to be used by professional writers, by the academe, students and just about anyone who gets pleasure and business out of the written word. The book provides simple and basic tips in writing (which I always manage to mangle). Do not overwrite – Guilty! Do not overstate – agaaaaaain!!!! Use ortho­dox spelling – guilty!!!! Avoid fancy words – OOOOOOPS!!!!! Do not inject opinion _ quite hard to do when I have opinion coming out of my ears! Use fig­ures of speech sparingly – I ALWAYS DO THIS!!!! MAJOR FAIL!!! Pre­fer the stan­dard to the offbeat — MAJOR FAIL AGAIN!!!!!!!!!!! I wish I could (can?) follow you Mr. Strunk and Mr. White, but I am not freaking perfect. Well, at least I tried to follow the rules…but then again, I was never good with rules.